A group of gaming enthusiasts at Mind Sports International (MSI) has created what is currently being called one of the worlds most advanced and expensive tournament Scrabble board game systems ever, costing in excess of nearly $32,000 to produce. MSI has given the famous Scrabble word game a 21st Century makeover utilizing custom built RFID technology in order the read the entire board almost instantaneously, while transmitting real-time information via unique software to viewers online. The game board consists of nine RFID circuit boards that house 225 RFID antennas, which read each individual Scrabble squares. Each letter tile has its own unique RFID tag embedded within, with an RFID circuit board enclosed in each of the player’s tile racks to ensure that all information is captured and showcased to the online viewers. 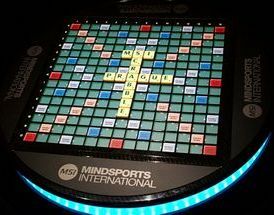 The Scrabble set will be unveiled and used by participants at the Prague Mind Sports Festival, December 1 – 4, 2012. For more information about the festival and debut of the new Scrabble system, please visit: http://www.PragueMindSportsFestival.com.